Everyone when working for their boss they should know that their boss isn’t perfect at all times and they need to understand it. No matter what kinds of problems can arise in the workplace with respect to the manager, office meetings or any kind of relationships in the workplace being disrupted, the person needs to convey some kind of feedback to the boss so that something can be done about the problem going on in the workplace and there isn’t any further risk in the workplace. So whenever the employee needs to give feedback to their boss they need to do it in a very cautious yet effective way which can be done in some of these following ways. When a person has been working in an office or a company from a long time then they would likely to be more open to share things with their boss than they were at the initial stage when they had just joined the company. So they should realize that the feedback they wish to provide to the boss should only be done when they are comfortable with sharing it with the boss and mention it so that it looks like a diplomatic answer. It is always advisable for the person to first think about what they want to provide to their boss at that time and really see whether what they wish to say is really needed or not. If the kind of direct feedback isn’t required to be given at that very moment then the person should reconsider in not providing that kind of feedback at the moment to the boss. See how things plan out later on rather than thinking and assuming whether that feedback will help or hurt the boss. Feedback can come in either a positive way or in a negative way which isn’t needed to be said at that very moment. So it is needed to know for the person at what moment which kind of feedback needs to be given to their boss. If the stages are still just at the initial moments then no kind of direct negative feedback should be provided, instead provide a decent enough feedback and later on see how things plan out should be considered. At first when the person wishes to give their boss feedback regarding a particular topic they may not be so confident in talking directly to their boss at that moment. So it is a better approach and really advisable for the person instead of going through this kind of a discussion with their boss which may not work in their favour, they should write down some of their thoughts which they wish to convey to their boss and then approach them. Whenever the person considers writing everything first and then approaching the boss regarding the feedback then they must obtain and collect all the required information properly. The person can mention certain areas which are really need to be address to the boss on the part of any employee or on the part of the boss too. Without having any information it is a blind man’s game which will create a havoc and misinterpretation when feedback was conveyed. Whenever any kind of feedback needs to be conveyed to the boss it is necessary for the person to only speak about the topics which really need to be focused upon at this moment. Keep some of the other matter to be said later on which isn’t that important at this moment. If it really isn’t causing too much damage or any kind of difficulty then it can be made to wait and be conveyed later on. This means that whenever the person wants to give the boss any kind of feedback then if the feedback is in written form then it should never be sent to the boss by email or any other medium. But instead writing it down and giving it to the boss is the best way to convey the feedback as there will be no indirect way involved in it. While writing it down it shows your dedication and truthfulness to the statement a person is with holding. Therefore, it is advisable to write it down in a Proper format which has all the key points of official letter. At times a single person may not only give feedback to their boss as a group of people pertaining to that matter may also do it which is fine. But at times it has to be ensured whenever the feedback is being conveyed to the boss by the person, any unwanted people or colleagues need not be present around as there would be some level of privacy which should be maintained and respected between both without any other person disturbing it. It is well known that in the work place the boss doesn’t like being ganged up upon when a group of people or even a single person are ganging up on them. Though there is some feedback to be given to the boss there is an appropriate way of doing so in a way by first talking to the boss and then scheduling a time for it to let the discussion happen. If needed even a third person may be present at the time when the discussion is taking place. Whenever the person is conveying feedback to their boss they shouldn’t do it in public in front of everyone in the office. If the boss has their own office then if the person wishes to speak to them then they can let the boss know personally, via an email or a message that they wish to speak with them to let them know that they wish to speak to the boss regarding and see a good time for that. Speaking in public will bring an awkward situation for everybody around. It is a 50/50 stake situation; it will either make a cut out or can turn into a failure. It is always the best thing for a person to be completely open as well as honest with the boss regarding whatever the issue or whatever feedback they wish to give them whether it would be good or bad. But it is one of the best ways for both as there is a chance to be open with each other and really see and let the other one know how they feel about whatever they wish to speak with the other. As we all know that honesty is the best policy. Therefore, one should always keep in mind that being honest will make the statement more soundproof. Whenever the person is giving feedback to their boss they need to be clear and state the purpose of why they are giving their boss feedback in turn linking it to the business objectives and its goals. When feedback will be regarding the business and things like how productivity can be improved and also how to improve profit will be interesting for the boss to hear. It is always know that feedback cannot be one sided in nature as both people should be able to speak about the topic they are currently discussing. Whenever the person provides certain feedback to the boss about themselves or any other thing in particular the person must give their boss a chance to explain themselves and get some kind of feedback from them about what they think. Whenever the boss and the employee are giving feedback to each other, the employee shouldn’t use a very harsh and direct tone but they need to be really direct in what they wish to convey with one another. The boss will appreciate it if the person is staying to the point when giving their feedback to the boss and if certain points have been written down by them then even better. The feedback which is being conveyed by the person to the boss should never be personal in nature. The boss also should understand when the person is conveying certain feedback to them, they shouldn’t take it personally as it is referring to the business and at the same time the person shouldn’t make the conversation personal when they speak to the boss. If the person doesn’t know their best approach when it comes to approaching their boss when it comes to providing them with feedback, it would be considered as a viable option to get some advice from the company’s HR department by setting up a meeting. Let them act as a medium between the boss and the employee so that only what is necessary can be responded accordingly. When there is a discussion going on between the employee who is giving feedback to the boss, it is expected that even if the conversation is casual the person should insist on asking the boss for some feedback in return during the conversation to know where they are lacking in their everyday work life. It will also let the boss understand that the person wants to improve in their work life. Whenever the employee gets an opportunity to let the boss know about certain feedback it is expected that they shouldn’t directly start unloading on the boss regarding what is going wrong in the firm. But it is much advisable that they show the boss that they are able to handle any kind of situation which arises in the workplace and let the boss realize that everything can be carried out as a team and in an effective way. It is a very good thing for the employee to have a dialogue with their boss from time to time. The person needs to talk to the boss about certain projects and goals which have to be achieved by the company. This helps the employee to have an idea regarding what has to be discussed between both of them and when. This way communication also improves. Whenever the employee makes a list regarding what they have been observing in the workplace, some tasks are kept as priorities and these tasks should be given a prior importance when spoken to the boss, so that the boss can look towards what feedback is provided regarding those priorities and work on it immediately. Preparation is a key before anything is put into practise. The same can be said before giving feedback regarding a specific task as it is better for the employee at the time of speaking to the boss. It shows the boss that the employee is well prepared towards what they want to discuss with one another and will only focus on what has really to be discussed. So when providing feedback to the boss it is expected that the person or the employee does the task in a very cautious manner so that there aren’t any kind of misunderstandings when the discussion is taking place and keeping the conversation only to the point and not going off topic. 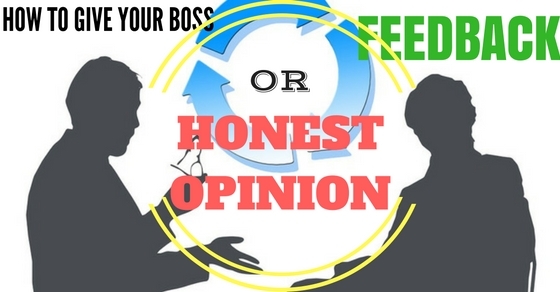 So the employee needs to be very wise before giving the boss any feedback and make sure that they do not go wrong in any manner and look forward towards improving the relations with the boss and themselves.